Featuring a new take on the classic FITS PerforMAX All Season Pull On Breech, now in new colors and now with a side cargo pocket. Perfect for a cell phone, keys, credit card, or other essentials. The new breech colors coordinate beautifully with the new Sea Breeze Shirts (short sleeve and long sleeve - links below). 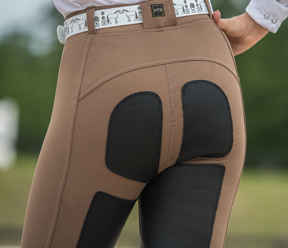 There are two all-new breeches in the spring line-up: The new FITS Olivia Full Seat Tread Breech and the FITS Pippa Knee Patch Breech. Both are made with luxurious performance fabrics for an amazing look and durable wear.